Let's be honest: this 2019 Alberta election wasn't expected to be interesting (in terms of the horse race itself) and we are getting exactly what we thought we would get. Sure, some polls at the beginning of the actual campaign might have suggested a tighter race with the NDP pulling off its one path to victory: sweeping Edmonton and increasing in Calgary to win most, if not all, of the seats there. This narrow path would possibly allow the NDP of Rachel Notley to stay in power despite facing a united right this time around. But recent polls show the UCP well ahead of the NDP. The incumbent is actually doing alright. I mean, 4 years ago, the NDP got to 40% of the votes thanks to a huge dissatisfaction with the Conservative government. It was clear not all of the NDP votes were coming from true supporters. So to see the NDP polling around the 2015 levels is already pretty impressive. The issue, and it's a massive one, is that the right is now united. Here are the current projections. Remember that you can make your own using the simulator here. The riding by riding projections are the end of this post. If the PC and Wildrose had been united in 2015, they'd have won a majority of the seats. My model assumes that the merger kept 90% of the votes (with the remaining 10% going to the Freedom Conservative as well as simply not voting). Current polling numbers suggest the UCP is slightly above the 50% mark and therefore increasing from the 90% sum of the two parties in 2015. In other words: in a very, very good position to win. I don't have the simulations ready for this model (I'll really try to have it done for my final projections on Monday next week) but there is very little uncertainty at this point. The other issue for the NDP is that the (behind paywall) riding polls from Mainstreet are showing the UCP doing better than expected so far. Remember that the riding polls were showing the PC with a much bigger lead over the NDP than the provincial polls in Ontario. These riding polls were right. Same in Quebec where the riding polls were showing the Liberals much lower than expected. 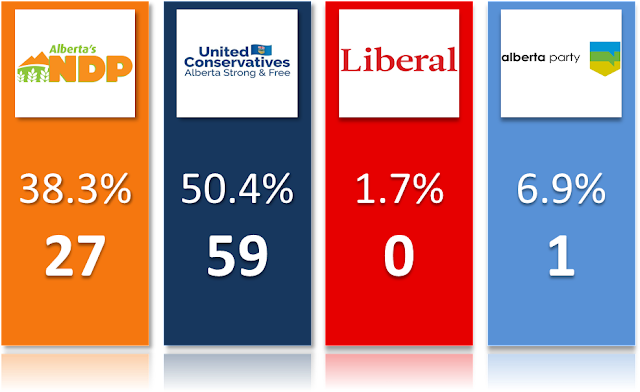 We haven't had many of these riding polls yet in Alberta but the current trend isn't good for the NDP. It's not a massive difference but if we were to use these polls to estimate the swings and project the province-wide percentages, that would boost the UCP by 2-3 points and lower the NDP by the same margin (that means the recent Forum poll might be the most accurate. That will trigger some pseudo data-nerds on Reddit or Twitter who always hate Forum). Yes those riding polls can be quite inaccurate taken individually and we don't have many so far. Still, that's just another sign that a surprise NDP victory isn't likely to happen. Look, it's a two-way race with an electoral system that usually rewards the party finishing first with a majority. The United Conservatives could actually win a majority even if there was proportional representation! Think about it... Whoever is telling you there is a lot of uncertainty is just lying. There is one scenario that allows the NDP to stay in power, we mentioned it already: sweeping all (or almost all) of Edmonton (26 seats), winning a majority in Calgary (28 seats in this region) and then getting a few seats elsewhere. Since the global percentages have the NDP slightly below their 2015 numbers, it means the NDP needs its vote to become a lot more efficient. Essentially pulling a BC NDP by increasing in urban centers and decreasing elsewhere. As a matter of fact, the NDP could even drop a little bit in Edmonton. The polls are showing that this scenario is indeed partially happening. The NDP's lead in Edmonton appears smaller while the party is more competitive in Calgary. Specifically, in 2015 the NDP got around 34% in Calgary against 55% for the Wildrose+PC. This year, polls are showing a 37-49 race. Slightly better but way too far from allowing the NDP to win a majority of seats there. Let's look at it another way: in Edmonton, the NDP is projected to win all the 20 core urban seats. In the suburbs or the greater Edmonton, the UCP is currently winning 5 out of the 6 seats. In 2015 the NDP would have won 3 seats against the UCP. Why are the United Conservatives gaining? Because the polls, and the model, are showing the NDP down in Edmonton overall. So for the sake of best-case scenario, let's imagine the NDP drops in Edmonton but only in ridings where it'd still win easily. Let's imagine the NDP vote even becomes super efficient and wins 4 out of 6 of the suburbs seats. That leaves us with 24 seats for the NDP from the greater Edmonton. That is really the absolute best case scenario. Let's look at Calgary. The current projections have the NDP winning only 4 seats. The issue is the NDP is losing only 3 seats by a margin of less than 10 points. Let's imagine the polls are wrong and the NDP, in this region, isn't trailing by 12 points but pretty much tied at 44%. Then the NDP could win 14 seats there. Except that, in order for this best-case scenario to happen, we need the polls to massively underestimate the NDP (in Calgary at least) and the NDP vote to be incredibly efficient in the Edmonton suburb and the rest of Alberta. So again, is it possible? Yes it is. But it's super unlikely.